OMAHA - Dr. Deanna Armstrong grew up on a farm in western Nebraska, but she had dreams of practicing medicine. Though she was intrigued by animal care and veterinary work, she really wanted to treat humans. Dr. Armstrong has joined the plastic surgery staff on the Methodist Women’s Hospital campus. She specializes in breast reconstruction, reduction and augmentation. She earned her bachelor’s degree in biology from the University of Nebraska-Lincoln. She received her medical degree from the University of Nebraska Medical Center in Omaha and completed a general surgery residency there. She also was a plastic and reconstructive surgery resident at the University of Pittsburgh Medical Center. 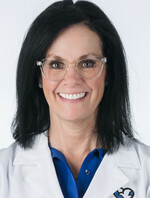 She previously was a plastic surgeon in private practice with CHI Health in Omaha. Helping breast cancer patients throughout their journeys is her favorite part of her work, she said. “The best thing is when they’re happy with their final result and we can say goodbye with a tear in our eye and a hug,” Dr. Armstrong said. Being a part of a team committed to the highest standards motivates her. Dr. Armstrong is now seeing patients at Methodist Physicians Clinic 192Dodge (717 N. 190th Plaza). Appointments can be made by calling 402-815-2300.